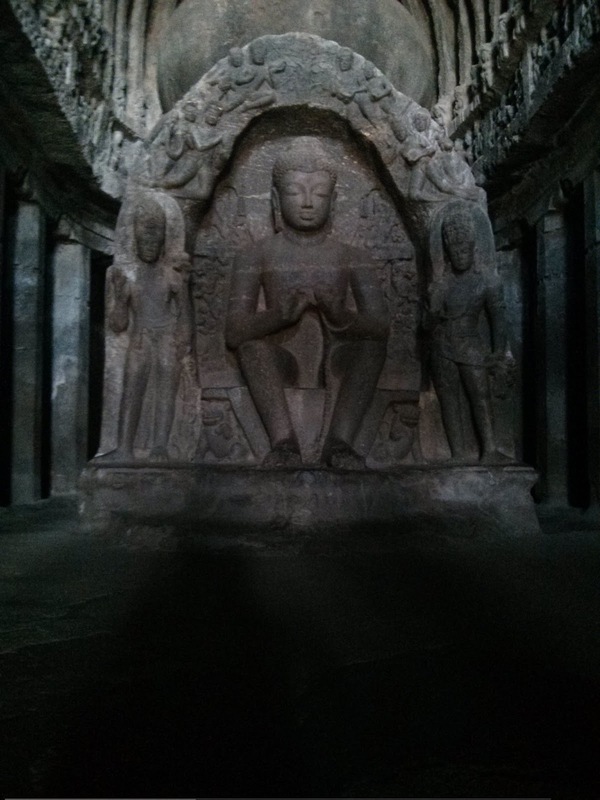 You can get The First Hand guide to Ajanta Ellora by signing up here. So upon deciding to give a shot to the UNESCO challenge we started to decide what would be the first place we would kick start our journey with. And with the feasibility study done it was to be Aurangabad which gave us the opportunity to cover both Ajanta and Ellora caves. The trip started with the train journey from Hyderabad to Aurangabad. The train came in 15 minutes late but started on time and we were off to a journey which atleast I will remember for a while. Unexpectedly the toilets were clean and it was really cold. Armed with the latest by Amish Tripathi I spent the cold night reading in my phone’s dim light till around 3 in the night. Had a brief chat with AJ who was also struggling to sleep in the cold. We had forgotten to pack covers for our sleeper journey. Somehow I managed to sleep for half an hour. And in those thirty minutes my phone was stolen from my side upper berth due to me being stupid or trusting I don’t know. With a hopeful attitude and minus my beloved phone we got off at the station some thirty minutes late than the scheduled arrival. We walked to our hotel Regal Plaza which was about a Km from the station. We were welcomed at the reception and booked our excursion tickets for the day. 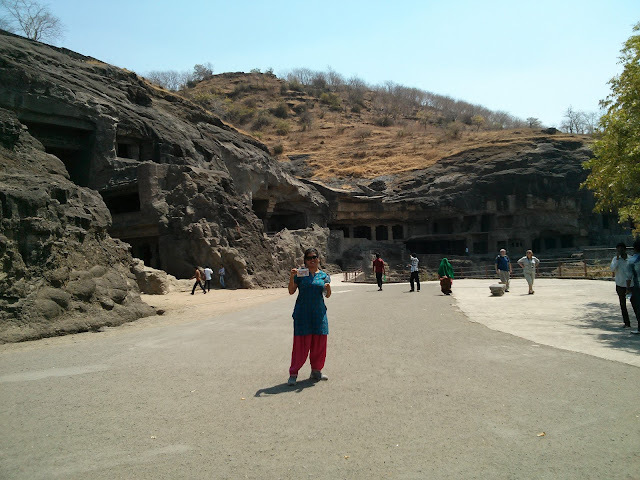 It was to be Ellora caves visit today along with other attractions that the city has to offer. We still had an hour and a half to spare before the bus pickup was due. We took our hot showers and ordered breakfast. I promptly fell asleep after the breakfast while AJ went ahead with the facebook game stuff he was doing. It was 9:30n and we got down from our room to get to the bus waiting for us and were received by the conductor of the bus. Walked a few meters to get on the bus and then it started. We were scheduled to visit five places- Daulatabad Fort, Ellora caves, Jyotirling temple, Bibi ka Makbara and Pan chakki. 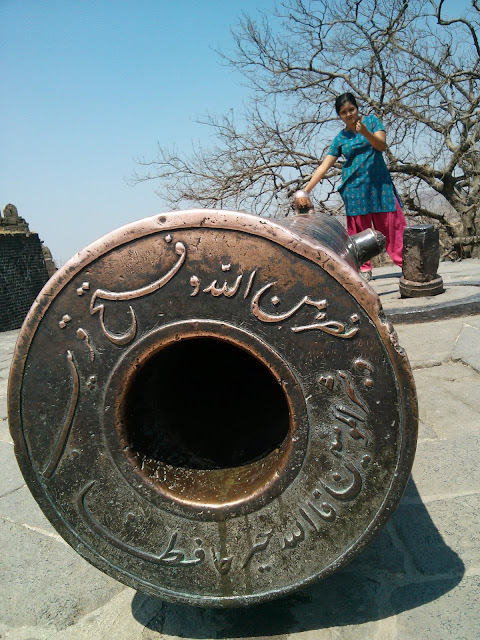 Daulatabad fort which is now in ruins was a sight to behold with its minaret and the cannon. It was very peaceful apart from the kids running up and down. This being said the fort gave me a nice exercise as we climbed up its huge number of stairs. I am sure the guide did tell us the number of steps but I can’t remember. Our guide was a decently knowledgeable man. I have this resentment towards the guides as they tend to dictate what you must or must not see. Plus I feel they just recite what they have crammed up from history books. But the guide we had this time was better than the very few guides we have ever had. The first cave we visited was a Buddhist chaitya with Buddha in a teaching pose and a backdrop of stupa. The cave was very quiet and peaceful in spite of the people who would not shut up even after being told. We did have such a family with us whom we named the ‘ready’ family. They were highly sure that taking photographs at every nook and corner of a place was the way to go. More often than not the father would scout a location and catch clueless bystanders to click a certain shot in a certain way and the thing was...’ready bolna, huh’. We managed to avoid the clutches on our first day’s outing but were not so lucky the next day, but that’s for later. After the chaitya we visited another cave that was a vihar or the dwelling area for the Buddhist monks. The austerity of these is quite shocking. Each small chamber is furnished with a stone bed complete with a stone pillow. Everything felt to be a size smaller than required; well I don’t know they might not have been tall. We had lost charge in AJ’s mobile and were without a camera here on. The next cave to be visited should not be called as a cave it is undoubtedly the best rock cut architecture I have seen to date, the Kailasa temple. Cut from Basalt Mountain a temple in its full form welcomes you with a ganesha statue. With other gods and goddesses welcoming you to the magnificent temple if you raise your head you can appreciate the heights from which the floor you are standing on has been cut. After you purify yourself from the ganga-yamuna- saraswati, the trio of Indian rivers you move up to the main shrine. A shiva-ling awaits you to bless you in all its glory. Since my visit to khajuraho and discovering some lingam with an octagonal base I now look at every shiva linga trying to look for that octagonal base, and here it was again. There might actually be something to the description of shiva lingam I had read in a book back in college. Terribly tired we headed to the MTDC restaurant to get our lunch where we got to know some of our co passengers. Funny thing none of us exchanged names. 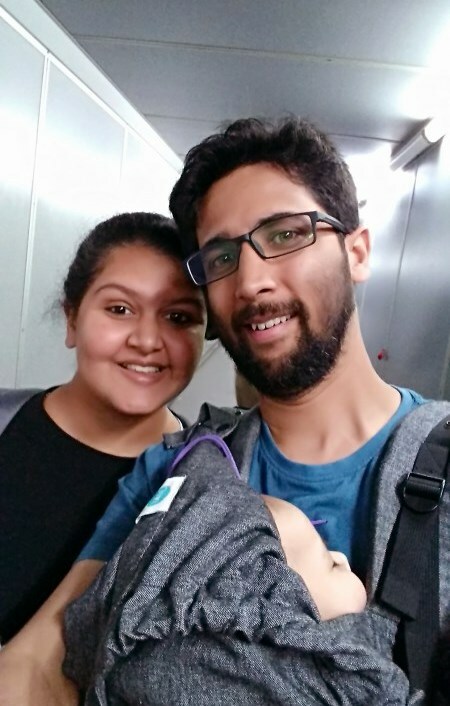 There was this couple from Britain who were on a travelling tryst after selling their house. It was nice to hear about your country from a distant pair of eyes. They are travelling on trains and had taken a passenger from Mumbai to Aurangabad. Another was a guy from Germany who had been travelling through India and was off to Goa. Another was a pair of two guys from Pune working with Skoda in Aurangabad for their training. Satisfied and recharged we took the bus to the temple. Mahashivratri was next day and we could see the temple in preparation. As awe moved in collecting some puja samagri we were told men had to take off their shirts. This did not go well with AJ and he was more than ready to turn back. Somehow I managed to not only get him in the temple but he also did the brief puja. I got a small souvenir a green beads string. I looped it around my wrist as it could never get around my neck for sure. Next stop Bibi ka makbara. Anyone who has ever visited Taj mahal would feel pity for the monument as it could be maintained so much better thant the current state. Undoubtedly it did not have the appeal that Taj has but I guess everybody who visits the city usually visits the monument too. A mini replica of Taj it would definitely have had sprawling gardens as is evident from the dried grass which exists today. Now we were onto the bus for our final stop for the day- Pan chakki. The flour mill which works on water pressure must’ve been a revolution for its time. After peaking in the enclosure which houses the fan which turns the mill we were off to the bus to be dropped off at our hotel. We confirmed that we would be taking the next day’s tour to Ajanta as well. We were to get on the bus at 8:30.